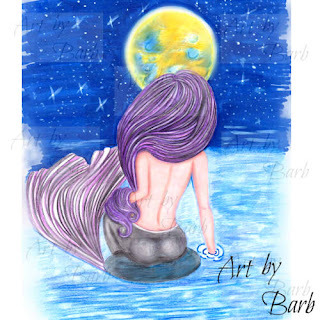 This image is coloured with promarkers and colour pencils, however I realised through the ink process that I wasn't happy with her tail, I imagined a slow and smooth fan motion of the tail gently swishing in and out of the water to capture her contentment and enjoyment of each moment immersed in the shimming moon light. I drew some clouds to add atmosphere plus a couple of dragonflies to add interest and to complete the image. This is the finished lineart. It doesn't need to be coloured as a moonlite scene. You might see a bright sun shinny day! 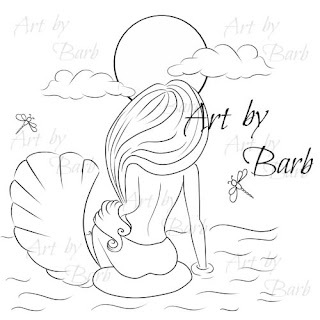 Visit Art by Barb group to view this image and browse more original art to colour.